In 2012, the Faculty of Health and Social Care was granted the funding necessary to purchase and install a new Digital Diagnostic X-ray room in their landmark building, K2, which houses a suite of sophisticated skills laboratories for health and social care students. Fujifilm's D-EVO Suite will offer superb quality, great performance and fantastic flexibility with a range of operator benefits to enhance performance. Fujifilm is a pioneer in diagnostic imaging and information systems for healthcare facilities, with a range of constantly evolving clinically proven products and technologies designed to assist medical professionals perform more efficiently and effectively. Radiography is a dynamic and developing profession at the technological forefront of the fast-changing healthcare environment. Through a combination of academic study and clinical practice, the course provides an all-encompassing experience that, on completion, enables graduates to apply for registration with the Health and Care Professions Council (HCPC) as a diagnostic radiographer - a requirement for practice in the UK. The Faculty of Health and Social Care provides students with the opportunity to obtain a BSc (Hons) in Diagnostic Radiography, a course that is accredited by the Society and College of Radiographers (SCoR) and approved by the Health & Care Professions Council (HCPC), as well as a range of other accredited courses. Commenting on the new Digital Diagnostic X-ray room, Professor David Phoenix, Vice Chancellor of LSBU said: "These new facilities enable London South Bank University to offer radiography students the best possible learning facilities and will add significant value to their practical learning experience. 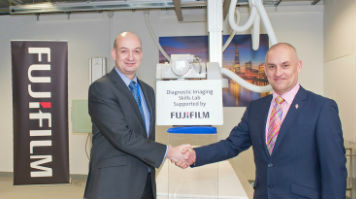 "Furthermore the on-going partnership with Fujifilm has the potential to provide a range of research and enterprise opportunities of benefit to our staff and students as well as service users."